If you are having double glazing installed in your home or for your business premises in the near future, you might be pondering on the size of the job and the disruption it’s going to cause. Compared to some of the world’s biggest buildings, however, domestic window installations are just a drop in the ocean. As we build taller skyscrapers and bigger building, with ever engaging and innovative designs, glass is playing an important role. It may not be largest building in the world but this London landmark is pretty hard to miss. 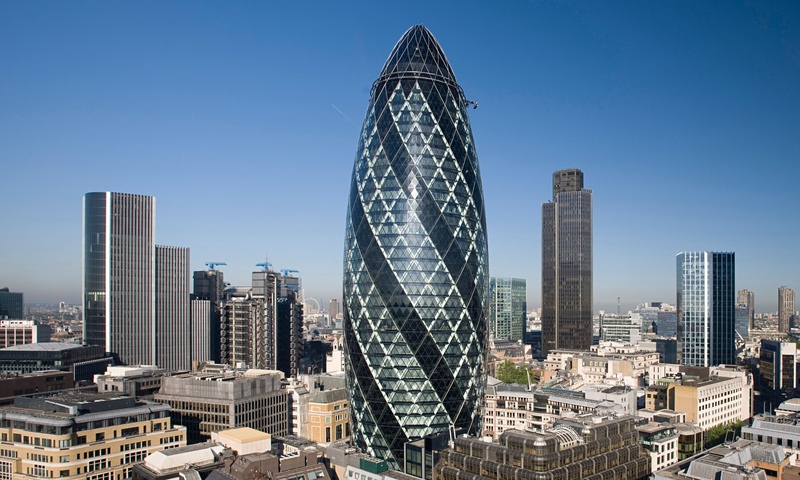 Designed by Norman Foster and officially called 30 St Mary Axe, it got the nickname Gherkin because of its shape. Standing proud in the business district of London, you have to climb 1037 steps to get to the top via one of its three stairwells. The building was constructed using some 35km of steel and comprises 7,429 panes of glass that could cover the equivalent of 3 football pitches. It’s not just height that makes a big building. In China you’ll find the New Century Global Centre which is currently the largest in terms of actual floor space covered. It may be only 330 feet tall but it covers a staggering 1.8 million square feet of space and houses everything from a luxury hotel to an IMAX cinema. The centre is offset by a huge dome window which actually has its own artificial sun to keep temperatures constant throughout the building. There are no offical figures for the number of glass panes used in the construction but one look at the roof and you’re in no doubt that the window cleaning bill must be immense. At over 540 metres in height, the One World Trade Centre in New York is now the fourth tallest building on the planet and the tallest in America. Construction started in 2006 and was finally completed in 2014. There are an astounding 54 high speed elevators in the 104 storey building and it was designed by David M Childs of Skidmore, Owens and Merrill. It’s clad in shimmering glass – over 2,000 panes in fact – and there’s an observatory on top, almost 1,300 feet above the street below. If you head to the United Arab Emirates, you’ll find the tallest building in the word called the Burj Khalifa in the centre of Dubai. At 829.8 metres high it was designed by the same company that brought us the One World Trade Centre and has broken numerous records. Not only is it the tallest structure ever built, it holds the record for the world’s highest elevator installation (as well as the highest restaurant and nightclub). With 163 floors it boasts the highest aluminium and glass façade, a stunning 512 metres in height. In total more than 26,000 panes of glass were used for the exterior of the building, all designed to provide solar and thermal energy, as well as having anti-glare properties to shield those inside from the hot desert sun. Glass is an important part in many modern commercial builds nowadays and it isn’t just reserved for megastructures like the Burj Khalifa. There are some pretty unusual designs out there too. The Basque Health Department in Bilbao, Spain, is one of the most extravagant looking buildings in the world and a sign that architects are finding new and innovative ways to build, creating structures that are not only there to impress but with glass that performs a variety of functions and helps to reduce operating costs and carbon footprints as well as look aesthetically pleasing. ← Do Your Facias and Guttering Need Replacing?